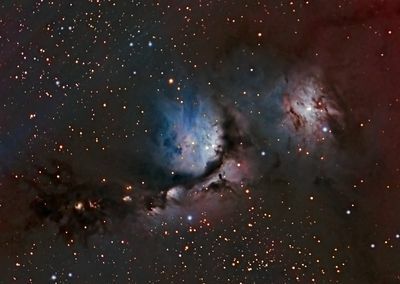 Messier 78 is a reflection nebula that is a part of a larger complex of nebulae in the constellation Orion . Several other reflection nebulae are seen in the image along with large clouds of dust (dark molecular cloud Orion B). Image is a total of 6 hr 50 min exposure (41 x 10 min lights @ -20 degrees; 20 darks, 64 flats, 64 bias) taken with a SBIG ST2000xcm CCD camera and a TeleVue 140 f/5 refractor on an Astro-Physics 1200 mount. Image acquisition software MaxIm DL; grading, calibration, registration, integration, processing with PixInsight 1.8.2 with final adjustment in Adobe Photoshop CC.